Everyone has heard the phrase “don’t judge a book by its cover,” which is used to say that one should take their time to get to know about something, whatever it is, before reaching a verdict. There are exceptions when doing just that would save you time, work, and perhaps even money. Akagami no Shirayuki-hime (Snow White with the Red Hair) falls within that uncomfortable category. Touted as a “shoujo” anime, it tells the tale of Shirayuki, a girl so beautiful and perfect you wouldn’t believe that it’s not a spoof. This girl spends her days with characters equally shallow in a fantasy world where everything is what it seems, and anything she touches becomes just a little bit better. Unless you’re new to anime, there’s nothing here to warrant a second look. This is a show that seems to be entirely defined by its genre and does almost nothing to spice things up, let alone subvert it. If I remember correctly, years ago, when Beast Player Erin was a new release, it was being presented as a children’s anime. I watched it and, while it’s true it had inclinations toward younger audiences, it had more than enough material to keep me interested in the comings and goings of Erin in that fantasy world. Years before it, there was Moribito: Guardian of the Spirit, another adaptation from a book series by Nahoko Uehashi. This time, again if memory serves me right, it was presented as an action-adventure anime. While it does have its share of action and adventure, a lot of time was spent developing the bond between the protagonist Balsa and Chagum, the boy left in her care. 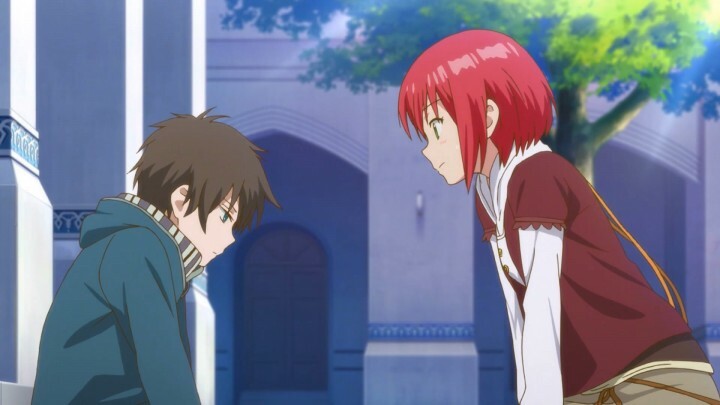 Akagami no Shirayuki-hime caught my attention because it was described as a show with a capable female character in a fantasy world, and presented as an anime based on an on-going shoujo manga (a comic series aimed at young girls). 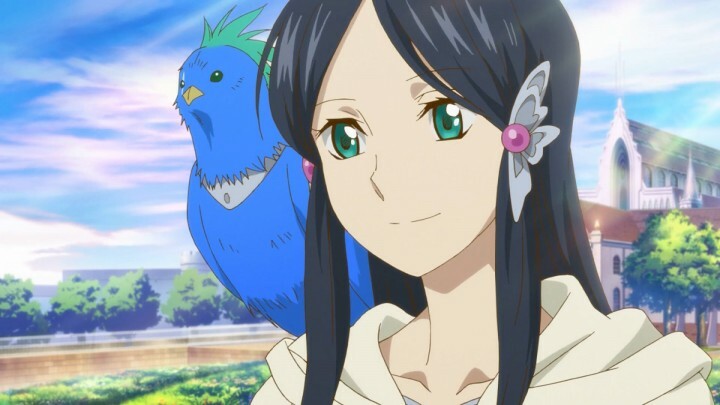 Considering that I had watched and liked very much Beast Player Erin and Moribito, shows that share the first two traits used to describe Akagami no Shirayuki-hime, I was quite curious about this one. The pitch itself was that a pretty girl with bright red hair, who is some sort of herbalist, is coerced by the Prince of her home country, Raj Schenazade of Tanbarun, into becoming his concubine because of how rare and beautiful a hair color like hers is. Shirayuki, the aforementioned girl, isn’t too fond of the idea and decides to run away and test her luck. While it doesn’t come off as “ingenious,” it certainly is enough to get the ball rolling. The show is very easy on the eyes with interesting character designs and colorful backgrounds that fit the character art well enough instead of clashing like in other shows. The art style doesn’t seem very unique but it easily manages to feel fresh and has a charm of its own. The morning following her escape, Shirayuki meets Zen and his two companions, Mitsuhide and Kiki, and they almost instantly hit it off. 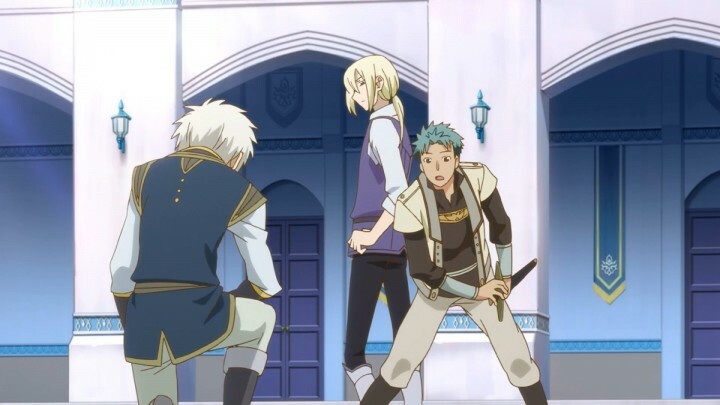 It turns out that the charismatic Zen Wisteria is the Second Prince of Clarines, who also has some skill as a swordfighter and is pretty good at intimidating those that would squabble with him over Shirayuki. After our heroine plays the old routine of “Oh no, I have become a burden to you, I’m so sorry!” and everyone around tells her that’s not the case, she quickly agrees to accompany them back to their country. 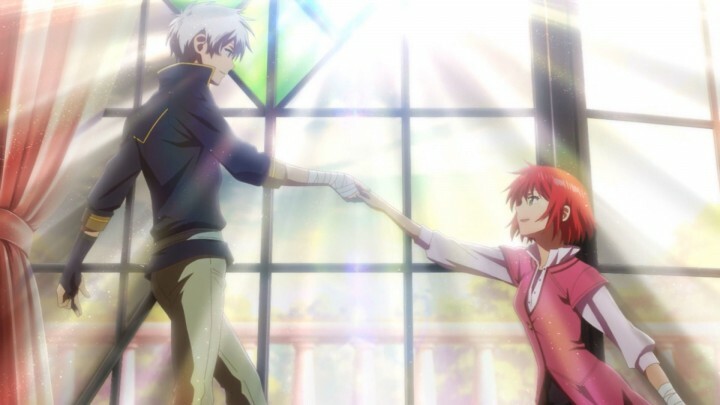 When I first watched this scene as the credits rolled, I wasn’t sure why things seemed to move so fast, and after finishing it I still wonder why the author decided to not have Shirayuki be on her own for a while before comfortably nestling under Zen’s wing. Whatever the case, it seems that our heroine made a pact with Mother Nature to have men rain on her from here on out. These couple of episodes have two main purposes. One seems to be exploring a little more about Shirayuki, not where she comes from but where she’s headed to and what tools she has to achieve that. The catalyst for this is Shirayuki’s search for a purpose to be in Clarines. The way she got there was practically through making friends with the prince and his bodyguards, but there was no real reason for her to stay there. This kind of “soul-searching” is usually part of the journey in a story, but here our heroine, barely a couple minutes into the episode, gets a pamphlet handed to her about an annual exam held by the castle to become a court herbalist apprentice, and now she’s set to go. 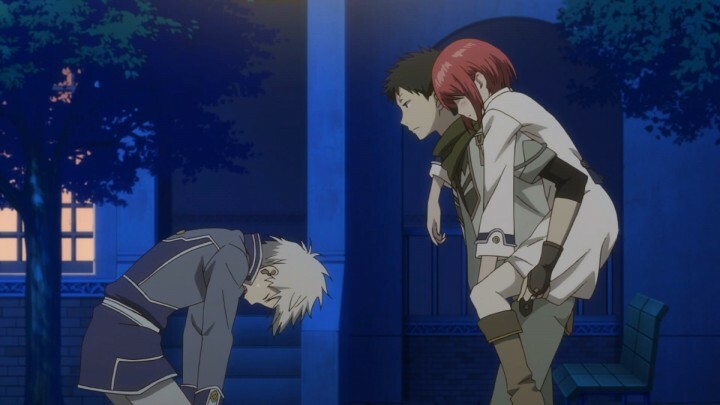 Shirayuki is meant to be an independent woman who “don’t need no man”. The other purpose, I think, is to present Shirayuki as a strong, independent (and very pretty) cartoon woman who “don’t need no man”, except for the part where she does. At one point she’s kidnapped by a dashing dark-maned outlaw that used to be part of a noble family. His sob story aside, he was planning on selling her because of her “natural jewels”, i.e., red hair. 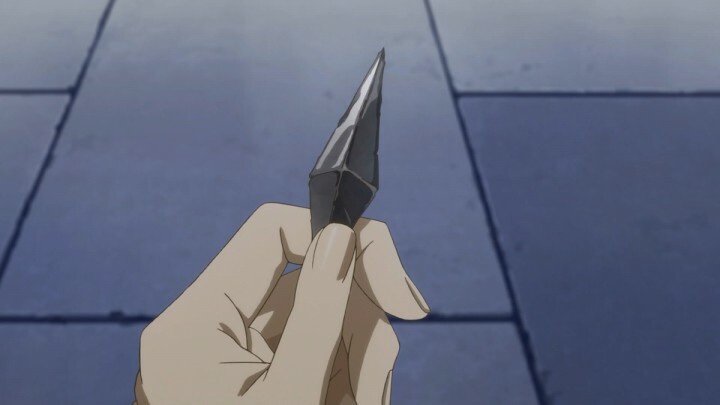 In the end, Zen saves the day by somehow finding the exact place she was being held, arriving at the exact spot at the exact moment she was about to get hit, stopping the guy, and then saying the exact words to make her heart pound and have the plethora of feelings stored from all two episodes well up in her eyes. It was so touching I forgot to cry. The next, more effective, attempt at making the protagonist seem capable of holding her own is by introducing an incidental antagonist, Marques Haruka. He’s concerned about Zen hanging out with the rabble, and has the idea of pulling Shirayuki apart from the prince. 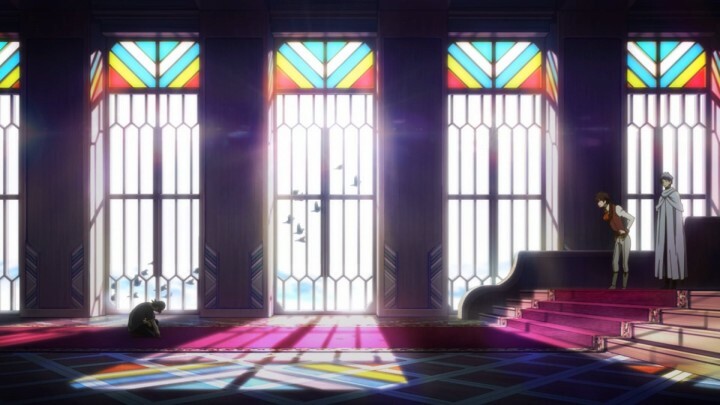 The climax is reached when Haruka spots her waiting for him at one of the castle’s hallways. In the confrontation she overwhelms the Marques by showing her conviction of seeing the prince, not by sneaking through the castle but by her own means. 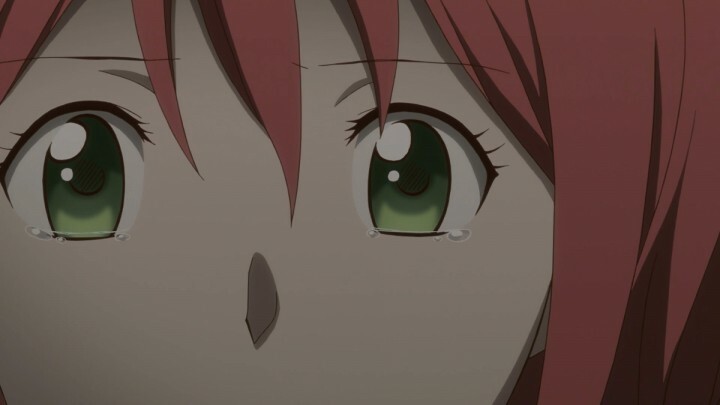 This scene showcases Shirayuki as a strong-willed individual that will do what’s deemed necessary, but never through methods that would compromise her beliefs. After the matter is resolved in her favor, our red-headed herbalist has not only gained the trust from Haruka and strengthened that special bond shared with Zen, but also earned a new follower in the form of Obi, the rogue with the devilish smile hired to scare her away. In case the point wasn’t made clear enough, these two episodes want to make sure you got that Shirayuki is a “young, bright, adroit, and resolute” woman. She’s one of the two that passed the apprenticeship exam, managing to impress Ryu, the youngest court herbalist, in the test he designed himself. But since impressing the young boy isn’t enough, she captivates him — not only with her looks, but also by showing frankness and openness when voicing her disagreement in situations where most people would not. Now that she’s an apprentice, part of her duties are running errands. Zen and co. have to go to Laxdo Fort to check up on the place and Shirayuki hitches a ride with them, since it’s close to where she’s headed. At the fort things are far from great, with most of the guards having fallen ill due to unknown circumstances. 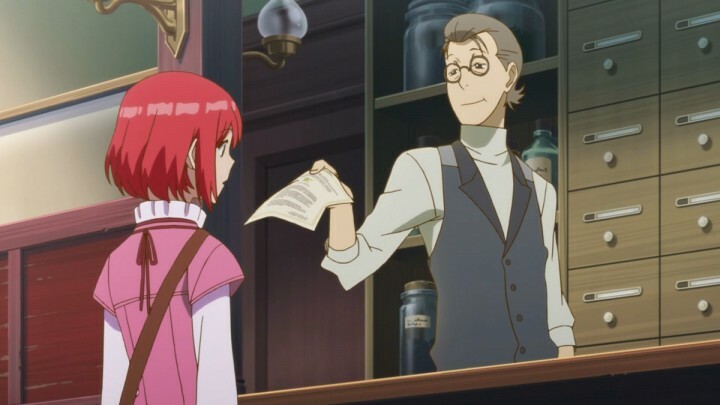 Once Shirayuki catches up to them, she treats the sick, finds the reason behind this mystery ailment, fixes it and gets another follower this time in the form of some really generic guy that has trouble making himself distinguishable from the background. Although not frequently mentioned, Zen’s presence in both episodes is big. 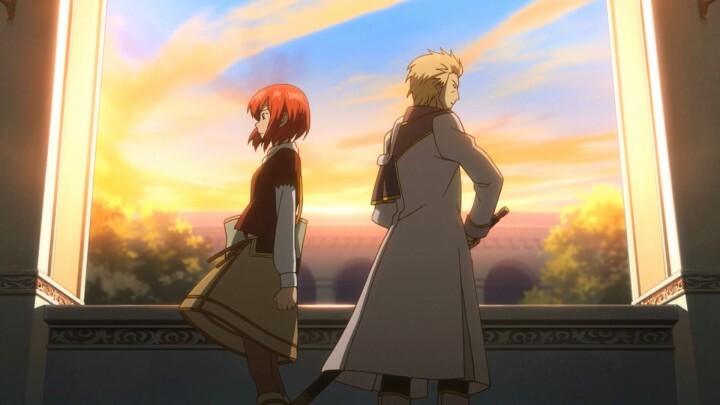 As with other occasions, we see him and Shirayuki grow closer as they share part of his past, and when he depends on her at the Laxdo Fort incident. The dynamic between both main characters has pretty much been set now. Shirayuki wants to be of use to Zen, sometimes to the point of overworking herself and becoming a burden — something that pains her greatly. Zen’s role is that of the protective figure, with hints of something that I can’t quite make if it’s fatherly conduct or slightly controlling. 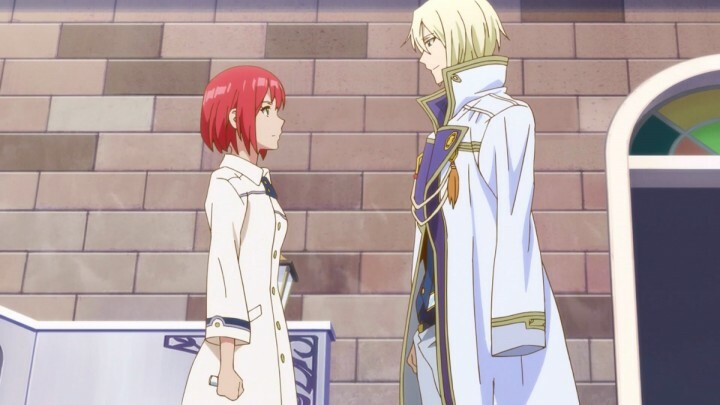 Either way it’s pretty easy to see that the “canon couple” are these two, which makes me wonder: what’s with all the other Shirayuki adherents? Are they just for decoration? This is nearing dangerous levels of fanfiction quality. Let me end this section with a simple observation. This is practically the halfway point, and by now Shirayuki has proven to have the following: being a really pretty, smart, and caring girl that everyone listens to and never makes a wrong decision (so far); has a budding entourage of handsome young men; is trusting and trustworthy, befriending almost anyone with ease; shares romantic feelings with a prince. And yet despite all this it doesn’t go to her head. The few missing bits for the perfect wish-fulfillment cocktail are having legendary creatures as pets and actually descending from royalty. Call me a cynic if you wish, but I believe this is nearing dangerous levels of fanfiction quality of characterization, if it hasn’t already. During previous episodes Zen has been shown to use his influence above others to get his own way, on numbered occasions. As the Second Prince that’s something to be expected, even if not lauded. But things are different when there’s somebody with a higher rank. This proves to be the case when Crown Prince Izana shows up and does more than rattle his little brother’s cage, repeatedly. 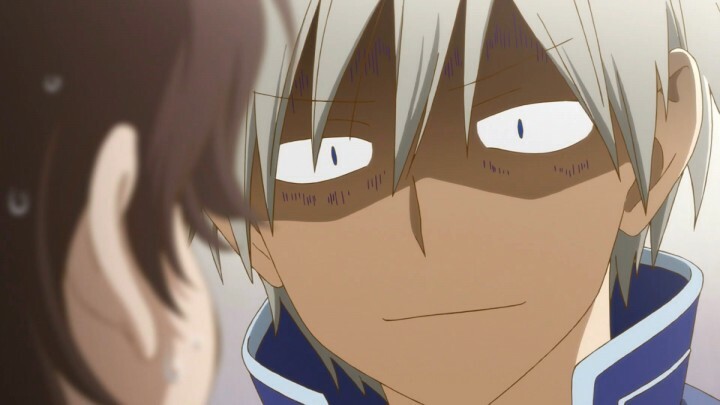 More than being there to tease Zen about his feelings for Shirayuki, his purpose is to provoke both of them to see how they react, with the goal of seeing if his brother has become a useless fool for having someone of low birth around him. Someone (the incidental antagonist) tries to separate the main couple. The antagonist and Shirayuki find themselves alone and discuss. Shirayuki convinces the antagonist that she’s cool. The most I can say about this is that Izana appears to be many things that Zen is not, and when comparing the two, it seems unlikely that Zen would end up like his brother even if both were to go through the same experiences. That’s praiseworthy, I guess, but I can’t shake the feeling that more than a character, Izana is a sort of concept or ideal of “the handsome and naughty prince” that manipulates others “for the good of the people” and always does it with style and flare. The image is so great and absurd that, if given his own series, its absurdity would outweigh everything else — and we’re already dealing with Mariyuki Sue with the red hair. 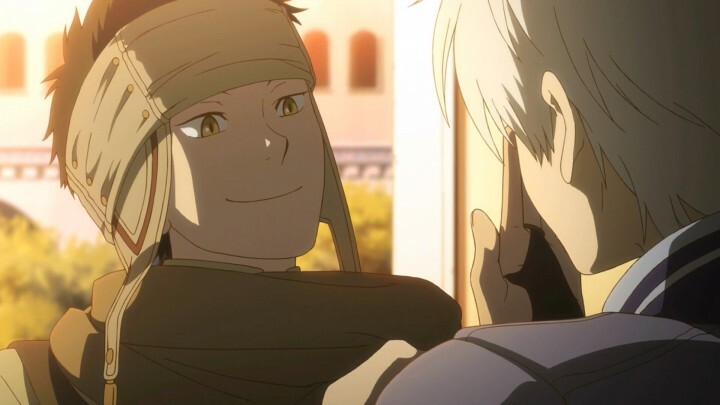 In all previous episodes, whenever part of Zen’s past is revealed Shirayuki is directly involved in some way, either through reading a record, or a heart-to-heart conversation. This is the first time where this formula isn’t followed and we see that, as a child, Zen was pretty much Izana’s lapdog; not because he was being pampered, but because he was at his brother’s complete disposition. With the introduction of Mitsuhide as Zen’s new attendant, this little system was put into question, not only through giving Zen a new tool for him to learn to use, but also as a way for Izana to keep tabs on his little brother. The reason for Mitsuhide’s assignment is that Zen had been secretly hanging out with a young boy named Atri who was working as an archer in the castle. Through the souring of this relationship, involving a tragedy of treason and death, we come to understand where Zen’s obsession for forming real interpersonal connections comes from, as well as his desire of becoming a man of good for those around him and for the citizens. Shirayuki is present during these episodes, but her role is mostly to be there so people don’t forget who’s the main character. All she pretty much does is get drunk, be a little silly, and show how much she cares about Zen. She starts developing a connection with Obi now that he’s been assigned as her guard, but it’s pretty clear there’s not going to be anything. What I hoped would be a change of pace, or a change of focus (or any kind of change for that matter) brought on by the previous couple of episodes was nothing of the sort. Once the spotlight is placed back on Shirayuki, everything becomes a common, bland, and boring love story between the perfect girl and trophy husband. A girl named Kihal Tohgrul is introduced to demonstrate how much of a good and competent young girl Shirayuki is, just in case you forgot. She helps Kihal with her dilemma and saves her people (and their birds) from the evil Lord Brecker, the ruler of the land she lives in. While performing such a feat, our redheaded heroine puts herself in danger, which pushes prince Zen to finally kiss her because…I don’t know, I think they realized they were running out of time and had to cut the rest of the praise singing stories. There’s a festival where everyone goes to have a good time. Since hanging out with Shirayuki is never dull, she gets to perform in a stage play as the princess. 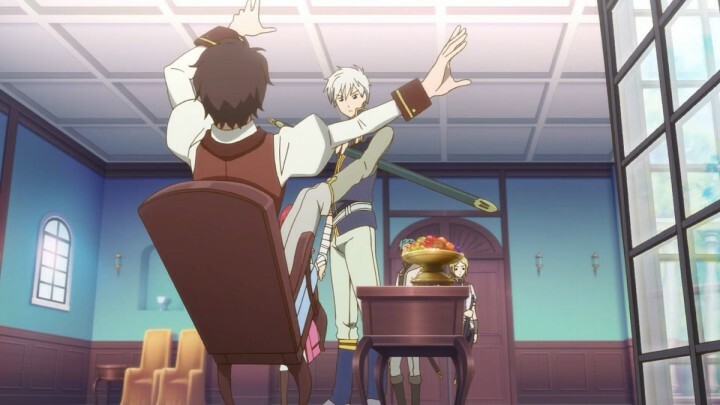 This makes Zen jealous of the actor playing the prince, so he decides to improve the spectacle by jumping in and showing how cool he is, impressing his girlfriend in the process. These sort of cloying scenes abound in the last episodes, which makes getting to the ending feel all the more exhausting. By now it’s clear that I didn’t like this series. Were it any other anime, from almost any other genre, I’d slap it with the “BAD” sticker without a second thought. But there are a number of factors that needed to be considered. 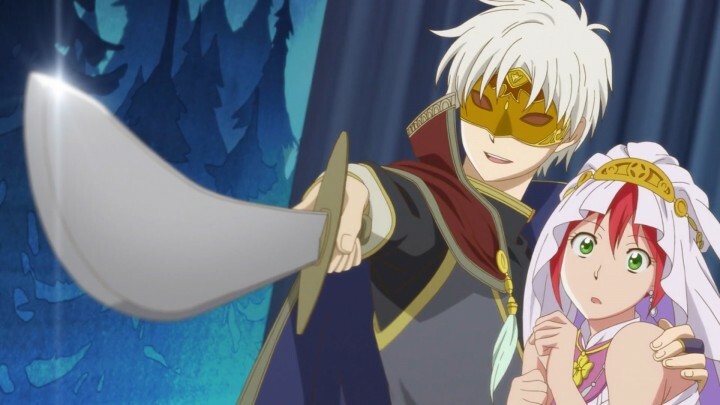 First is how I picked this one: I’ve already mentioned Moribito and Beast Player Erin as shows that, supposedly, share similar traits with Akagami no Shirayuki-hime; but those anime have stories that are of a completely different type from this one. They relate fantasy worlds with their histories and problems, both past and present, and it’s these rich lands populated by a variety of individuals where the main characters experience their adventures and political strife. 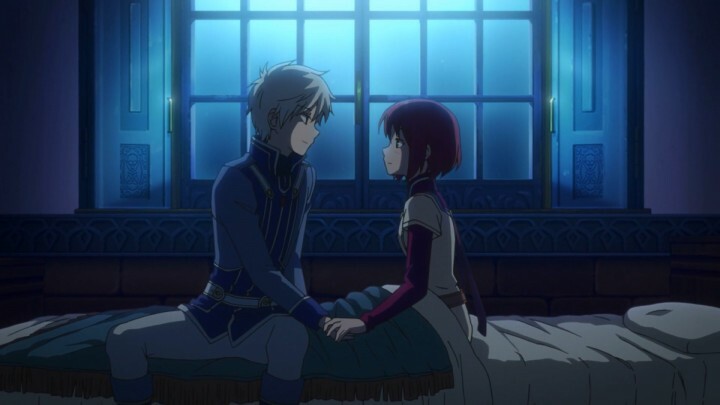 Akagami no Shirayuki-hime not only does not seem to have that exuberance in its setting, but also its interest is in more personal, romantic tales. The second factor is related to the first: Akagami no Shirayuki-hime‘s genre. This is clearly a shoujo anime, and it never tries to stray from that path. In other words, I’m not part of the targeted market. This is not usually the genre of entertainment I consume, which explains why I probably wouldn’t fall head over heels for this. I can’t look over how shallow and unauthentic everything felt. Despite taking that into account, after mulling it over for a while, I can’t look over how shallow and unauthentic everything felt from the start to the very end. It’s not only that Shirayuki is so perfect it damages the character, almost everyone around her is nearly as vapid and uninteresting as she is. The kingdom of Clarines follows the same trend, which makes me wonder why would Sorata Akizuki, the manga’s author, pick a fantasy setting if she’s barely going to show it to the audience. If the setting is so unimportant, it might as well be some high school — that way at least we already know how things are. The romance, which was supposed to be the strongest point, was so predictable and simplistic it never left space even for the idea of a love triangle, despite there being a bunch of willing and ready young men lining up for Shirayuki. In the end, I was so bored that I couldn’t think of a way to make fun of it while watching. If you want a fantasy world with female leads you’d be better off with Moribito: Guardian of the Spirit. If you want romance, Kimi ni Todoke is a good option. If you’re looking for a blend of the two I can’t think of a good example, but this is definitely not it.